Questions or comments about this website may be sent to the webmaster, by mailto: PublicYogi(at)gmail.com. I sell my dolls directly to collectors, not through retail outlets. Prices are currently in the $4,000 range. I am now working on dolls for people who are on my rather long waiting list. I have no dolls in stock available for sale. If you are interested in a place on the waiting list, please send me your name, address, and phone number. When you reach the top of the list, I will contact you. I will let you know the current prices and give you descriptions of current work. At that time, you may decide if you are still interested in acquiring a doll, and if so, details will be worked out. 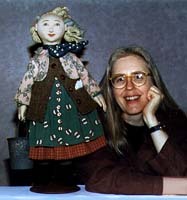 Since each doll is a unique hand-crafted design, its creation is a lengthy process. I show work and take names for the waiting list every summer at the NIADA (National Institute of American Doll Artists) conference.